“There’s another hole,” my fishing partner Lewis announced, snatching up a sculling paddle and swinging the johnboat toward a dark, flooded recess in the bottom of a huge hollow cypress tree. “You think one’s in there, too?” I asked. Lew paddled the boat close to the tree, then using a long, stout jigging pole, he maneuvered a live minnow right up to the hole and dropped it beside the dark nook. The cork above the bait hit the water, wobbled briefly, then shot out of sight. A brief struggle ensued as Lew tried to wrest the minnow-eater from its hideout. But within seconds, my fishing buddy had subdued the 2-pound bass at the end of his line. It was the fourth bass he’d caught using this same technique in other hollow trees. We were fishing on an east Arkansas oxbow lake that day. Every now and then Lewis would point to a hollow tree and announce cheerfully, “Bass hole!” About one-third of these spots produced a largemouth. We didn’t catch any lunkers, but the dozen or so 1- to 3-pounders we boated added spice to what had started out as a crappie fishing trip. The crappie weren’t biting, bass were. Largemouth bass are ambush predators. When the sun is high, they often hide in shady spots and bushwhack forage fish. Hollow cypress trees provide perfect lairs for their feeding activities. 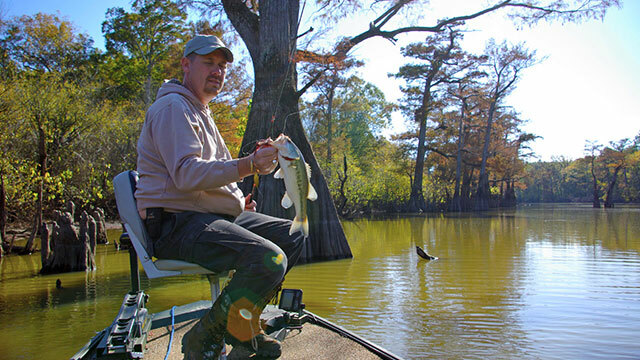 Drop a lively minnow into the hollow of a broad-based cypress and you will often find a bass at the end of your line (along with many bonus crappie and warmouths). Bald cypresses are classic trees of southern swamps, bayous, lakes and rivers. They range from coastal areas in Maryland to Texas and from the lower Mississippi River Valley to as far north as the southeastern corner of Missouri. Anglers who fish where cypress trees grow are well acquainted with the broad-buttressed giants (some live more than 1,000 years!) and know that largemouth bass often hide amongst the gnome-like knees that erupt from water surrounding the trees. Casting a lure beside a cypress and reeling it back to the boat often garners strikes from hard-hitting, high-jumping hawgs. But few anglers ever fish the insides of the trees where big hollows often form. Cypress wood is highly valued because it is very rot resistant. But bigger, older trees are highly prone to pecky rot fungus, a tree disease that attacks the heartwood and creates hollow interiors. That’s good news for anglers because the dark holes thus formed typically extend beneath the water and attract a variety of fish, including bass. It’s certainly harder to catch bass hiding in hollows rather than those cruising the trees’ perimeters. But on some days, particularly when the sun is high in a cloudless sky, bass retreat to the hollows to escape the bright light and await their prey. Most bass I find in these situations are suspended inside the hollow. A plastic worm or spinnerbait cast inside - if you’re good enough to do that - might be ignored and will sometimes spook a fish from its hideout. Usually, a lively shiner suspended in front of the fish beneath a bobber will entice bass to bite. The hollows typically aren’t very deep, so I like to place the bait so the bobber suspends it at a depth of 6 inches to 1 foot. This garners strikes most of the time, but if it doesn’t, I make adjustments until I find something that will. I often add a single split shot to carry the minnow down quicker, but when bass seem really fussy, it’s best to remove the weight and allow the bait more freedom of movement. Sometimes the bass stay far back in a hollow, especially if the tree is one of the ancient giants with a huge base. Most I catch, however, are positioned close to the opening, peering into the sunlit water from the edge of darkness. For that reason, it’s often best to place the minnow just outside the hollow, rather than inside it. A largemouth whose eyes are adjusted to the bright light outside may miss a bait placed in totally shady water. You can cast to such spots, if you’re a good caster, but I prefer using a long, sturdy fiberglass jigging pole. I use a 16-footer, and although it looks flimsy, it’s never broken. I’m caught a few 4- and 5-pounders using it. Employing a longer pole like this allows extra reach so you can swing your bait close to the hollow without spooking fish inside. Dabbling minnows in cypress hollows is a different way of bass fishing, for sure. But next time you visit a body of water where hollowed-out cypress trees are common, give it a try, especially if other tactics aren’t working. Catching bass in trees can be more fun and productive than you ever imagined.